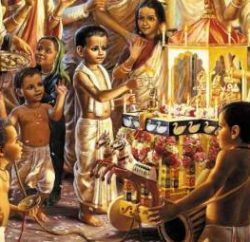 Glorification of Lord Nityananda, His appearance and childhood, pilgrimage, distributing Krishna-prema and many other pastimes. Narottama Dasa Thakura, one of the acharyas in the Gaudiya Vaishnava Sampradaya writes in glorification of the Lord that one will get the soothing moonlight of millions of moons when one takes shelter of Lord Nityananda’s lotus feet. If one really wants to enter into the dancing party of Radha-Krishna, he must firmly catch hold of His lotus feet. In the age of Kali-yuga, Lord Krishna advents in this material world as Lord Chaitanya Mahaprabhu along with Balarama appearing as Lord Nityananda. Lord Nityananda is also known as Nitai, Nityananda Prabhu and Nityananda Rama. He donned the role of Lord Chaitanya’s principal associate for spreading the chanting of the holy names of Lord Krishna in the form of Harinama-sankirtana. He distributed the mercy of Lord Krishna to all the fallen, materially conditioned souls of this age by congregational chanting of the Lord’s holy names. According to the teachings of the acharyas, Chaitanya Mahaprabhu cannot be approached or understood without taking shelter of Nityananda Prabhu, who is the original guru of all the universes. He serves as an intermediary between Lord Chaitanya and His devotees. He is the second body of the Lord, manifesting as Balarama to Sri Krishna, Lakshmana to Sri Rama and Nityananda to Chaitanya Mahaprabhu. Nityananda Prabhu appeared in the year 1473 in Ekachakra, a small village in West Bengal. There is a temple named Garbhasva in commemoration of the place of His appearance. Nityananda Prabhu appeared on the auspicious thirteenth day (trayodashi) of the bright fortnight of the month of Magha as the son of a pious brahmana. His parents were Hadai Pandita and Padmavati. The residents of Ekachakra were completely absorbed in the love of little Nitai. As a child, He loved to constantly enact the pastimes of Sri Krishna and Lord Rama with His boyhood friends. He spent the first twelve years enacting these kinds of pastimes. He has the whitish complexion of Lord Balarama and His voice is deep and melodious. In the thirteenth year, a travelling sannyasi who was a guest of the Lord’s parents requested them to send Nitai with him as a companion. His parents committed to Vedic culture, could not refuse his request and reluctantly parted with Nitai. Lord Nityananda toured the holy places in both Northern and Southern India until He arrived in Navadvipa and met Chaitanya Mahaprabhu. He visited different holy places in order to purify them of sins left behind by pilgrims. In the course of His pilgrimage, the Lord went to Gaya, Kashi, Prayaga, Mathura, Govardhana, Hastinapura, Dwaraka, Ayodhya, Haridwara and many other holy places. He took bath in many holy rivers on the way. The Lord next went to Badarikashrama and to the ashrama of Srila Vyasadeva and met him. On His pilgrimage tour, He also met Madhavendra Puri, Ishvara Puri and Brahmananda Puri who were all great devotees of Lord Krishna. He spent many days enjoying the ecstasy of krishna-katha in the association of Madhavendra Puri and his disciples. He then visited other places such as Setubandha, Danatirtha, Mayapuri, Avanti, Devapari, Trimala, Kurmakshetra, etc. Nityananda Prabhu met Chaitanya Mahaprabhu in 1506 at the age of 32 years when Lord Chaitanya was 20 years. Lord Nityananda in His role as the original spiritual master played a major part in spreading the yuga dharma of sankirtana all over the Gauda desha (Bengal, Odisha). His mercy was unlimited, and people fortunate to come in contact with Him relished the nectar of His instructions and were inundated with love of Godhead. Raghunatha dasa, one of the six Goswamis, started the celebrated Danda Mahotsava festival of Panihati by the mercy of Lord Nityananda and was thus able to serve Chaitanya Mahaprabhu. 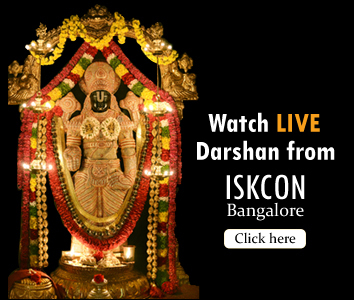 The festival is still being observed by devotees to this day. Due to the boundless mercy of Lord Nityananda, even the most fallen souls like Jagai and Madhai who were habituated to all kinds of sinful activities were delivered and converted to great Vaishnavas who took to the chanting of the holy names of Lord Krishna. He delivered many fools and fallen souls by freely distributing Krishna-prema. Lord Nityananda married Jahnava devi and Vasudha, the two daughters of Suryadasa Sarakhel who was the brother of Gauridasa Pandit – an intimate associate of Chaitanya Mahaprabhu and the spiritual master of Srila Shyamananda Pandit. Nityananda Prabhu had a son and daughter named Virabhadra and Gangadevi from Vasudha. 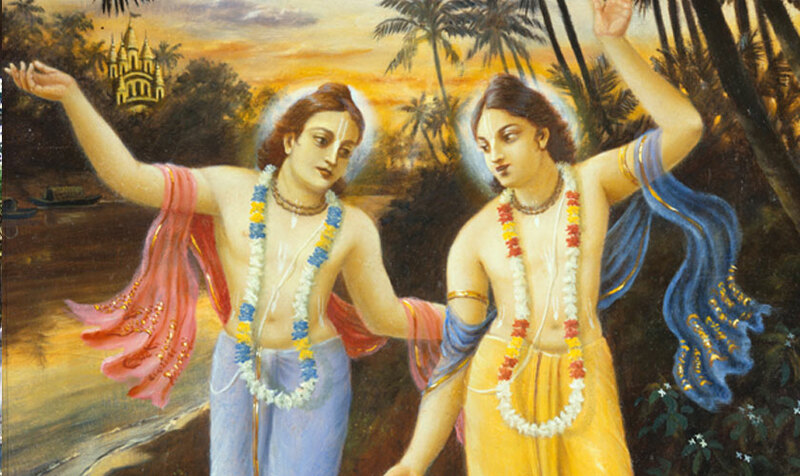 Once, Chaitanya Mahaprabhu invited Lord Nityananda to accept lunch at His home. Accepting the invitation, Lord Nityananda went with Lord Chaitanya and was received well at His home. When both the Lords sat down for lunch, it appeared as though Lord Ramachandra was having lunch with Lakshmana. As mother Shachi happily served Them food, They began to eat with loving exchanges. Then suddenly two plates of food turned into three plates. As the Lords began to smile, mother Shachi returned with more food but to her astonishment, she could find only two attractive little boys in the place of the Lords. One of Them was white and the other was black in complexion. Both of Them were naked and four-handed, holding a conch, disc, club, lotus, plow and stick. They were also adorned with Srivatsa and Kaustubha gems and wore fish-shaped earrings. Mother Shachi could also see her daughter-in-law within the heart of her son. Then suddenly she could no longer see anything. She fell to the ground with incessant tears of love which wetted her whole body and clothes. As she fell senseless, the rice that she was carrying was strewn all over the room. 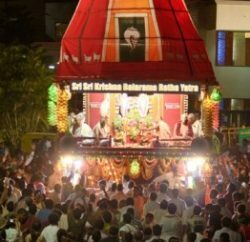 On another occasion, the Lord performed a grand kirtana in Panihati with His devotees. After this, He ordered His servants to conduct abhisheka to Him. All the devotees headed by Raghava Pandita made every arrangement and bathed the Lord with the water from the Ganges while everyone sang His glories. After abhisheka they dressed Him with new clothes and applied sandalwood paste to His body. They decorated Him with flower garlands and tulasi. Then the Lord sat on a throne and glanced at everybody showering them with Krishna-prema. Then He ordered Raghava Pandita to make a garland of kadamba flowers saying that He was very fond of those flowers. When Raghava Pandita humbly said that it was not the season for kadamba trees to flower, the Lord asked him to go home and look for them. When Raghava Pandita reached home, he was surprised to see beautiful fragrant kadamba flowers blossomed on the lemon tree in his courtyard. Overcome by ecstasy, Raghava Pandita quickly made a garland of them and offered it to the Lord. All the Vaishnavas thus felt very happy. The Lord wound-up His earthly pastimes by entering into the Deity of Bankim Ray (Krishna), situated close to Ekachakra.